MISSOULA — Judith (Judy) Ann Spores passed away quietly at her home in Missoula on Sept. 13, 2018, with her husband at her side. Judy was born in Hamilton, Jan. 28, 1942, to Martin and Katherine (Parpolia) Jones. She was raised on the Bitterroot Stock Farm with her two brothers, Robert (Bob) and Donald (Don), where her father was a share cropper and later foreman. She enjoyed many a carefree day wandering the foothills and valleys of the east side hills of the Bitterroot valley on horseback. Judy attended school in Hamilton, graduating in 1960. After high school, she spread her wings and ventured to Long Beach, California, where she worked as a book keeper for three years. While there, she enjoyed bull fights in Tijuana and driving fast cars on the Bonneville Salt Flats. In 1964 she returned to Hamilton where she took a job with the US Forest Service and met a young forester, Dave Spores, from Bonners Ferry, Idaho. After a whirlwind romance (by today’s standards) they were married at St. Francis Church in Hamilton April 16, 1966. Little did she know what she was getting into. In 1967 Dave entered the US Army and Judy wound up moving first to Lawton, Oklahoma, and then, after Dave’s commissioning as an officer, to Anchorage, Alaska. While there Judy gave birth to a baby girl, Sheila Renae. After Dave’s release from active duty, they moved to Orofino, Idaho where Dave’s job required moves from winters in Orofino to summer headquarters on the North Fork of the Clearwater River. While there Judy had their second child, a son named David Patrick. Moves to Kooskia, Idaho; Bigfork; Libby, Grangeville, Idaho; and Washington D.C. followed before they settled in Missoula in 1988 for the remainder of Dave’s career and retirement. During this time Judy kept busy raising a family and working as a bookkeeper and office manager for various companies around the country. Her favorite, and last job, was as office manager and assistant to the sales manager at Lambros Real estate, a position she held for 16 years until her retirement in 2006. 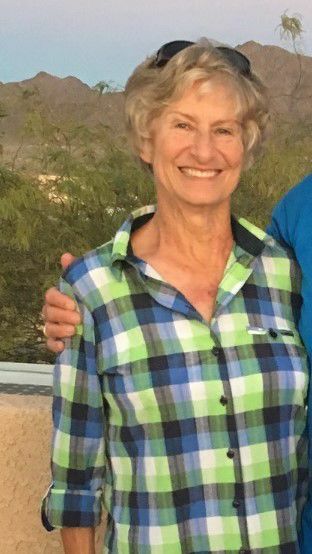 Judy’s primary focus was always family (including her dog Pepe), but she also enjoyed hiking, golf, rafting, boating, dinners with friends, traveling and playing games. She was known for the apparent ease with which she prepared and served great dinners for large gatherings of friends and family. She also arranged fabulous family trips to Cancun, St. Croix and the North fork of the Clearwater River. She helped create fabulous memories that will live on long after her passing. Judy was preceded in death by her father Martin and mother Katherine. She is survived by her husband of 52 years, Dave, at the family home in Missoula; her daughter Sheila with husband Shawn McAllister and grandson Cade of Ketchikan, Alaska; her son Evad Vanspoore’ with wife Rae and granddaughter Jasper of Billings; her brothers Bob of Hamilton and Don of Lincoln City, Oregon; and Dorothy Parpolia (Auntie “D”) of Hamilton. There will be a vigil and rosary Thursday, Sept. 20, 2018 at 7 p.m. followed by a funeral mass Friday at 10:30 a.m. at Saint Francis Xavier Catholic Church followed by a reception. Interment of ashes will be delayed until Dave’s passing when their ashes will be interred. In lieu of flowers the family requests donations in Judy’s name to the Montana Cancer Institute Foundation.